1 Bedroom Upper Floor Flat For Sale in Glasgow for Offers Over £123,999. 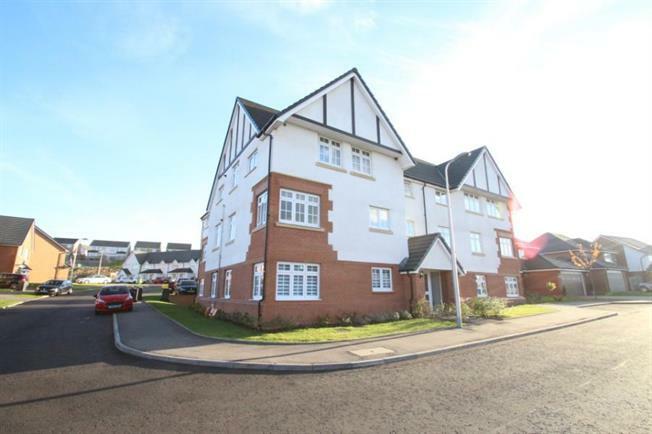 A stunning first floor apartment within a small block of similar properties within the extremely popular and sought-after Woodilee Village environment on the periphery of Lenzie with ease of access to the M80. This beautifully appointed and well-presented apartment has the benefit of dual aspect window configuration in the open plan kitchen / living room which ensures a bright and airy disposition. The present owners incorporated a number of extra features at the time of construction and personal appraisal is essential for a full appreciation of not only the thoughtfully planned internal layout but equally the high specification finish as well. The accommodation comprises: Entrance Hall with two built-in cupboards and door intercom entry hand set, Spacious open plan through Lounge/Dining/Kitchen including oven and gas hob plus integrated fridge/freezer, dish washer and washer/dryer, Double Bedroom with fitted wardrobes and Bathroom with three piece suite including bath with shower over. This outstanding property is further enhanced by Gas central heating, PVC double glazed windows, Allocated residents parking space, Communal visitor parking and Communal Garden Grounds. Located in the Woodilee Village area on the outskirts of Lenzie, Ballantyne Brae is in a delightful residential area yet with a feel of the countryside yet is with easy reach of local amenities and the train station is approximately one mile away which is ideal for those who commute and Glasgow City Centre is only some ten miles away by road. EER Band B.